I have this day received your letter of the 20th. Political opposition can never absolve gentlemen from a rigid adherence to the laws of honor or the rules of decorum. I neither claim such privilege myself nor indulge it in others. 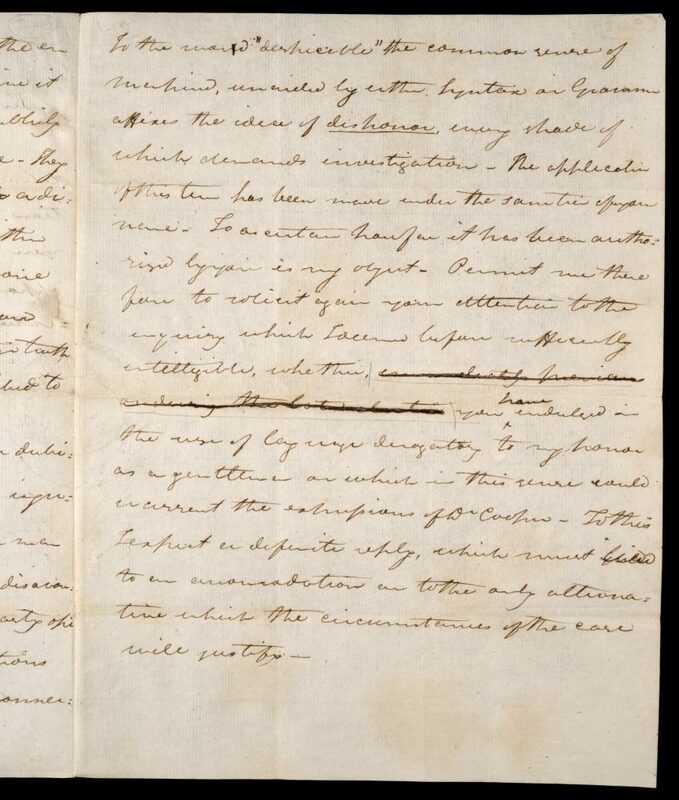 You appear sensible that from the style of your conversations inferences injurious to my character may have been drawn. I also feel a conviction that they have. Ordinary attention to the transactions of society and the language of the world would evince that opinions highly disreputable to me have been expressed by you. Justified by these circumstances and peculiarly urged by the formal declaration of Mr. Cooper’s respect for my own character and the opinion of the public demands the enquiry I have made. I can not [sic] conceive it incumbent on me to trace reports publicly and extensively diffused to their source. They exist and can only be contradicted by a direct application to you. They are either well or ill founded, which you alone can know, and a refusal to disavow them is not only a confirmation of their truth, but an adoption of the sentiments ascribed to you. If you have used language of a dubious import without intending to convey injurious impressions, it behoves you as a man “of sincerity and delicacy,” by a general disavowal of such intention to correct the hasty opinions of others and remove imputations which have thus been improperly connected with my reputation. To the word “despicable” the common sense of mankind, unaided by either syntax or grammar affixes the idea of dishonor, every shade of which demands investigation. The application of this term has been made under the sanction of your name. To ascertain how far it has been authorized by you is my object. 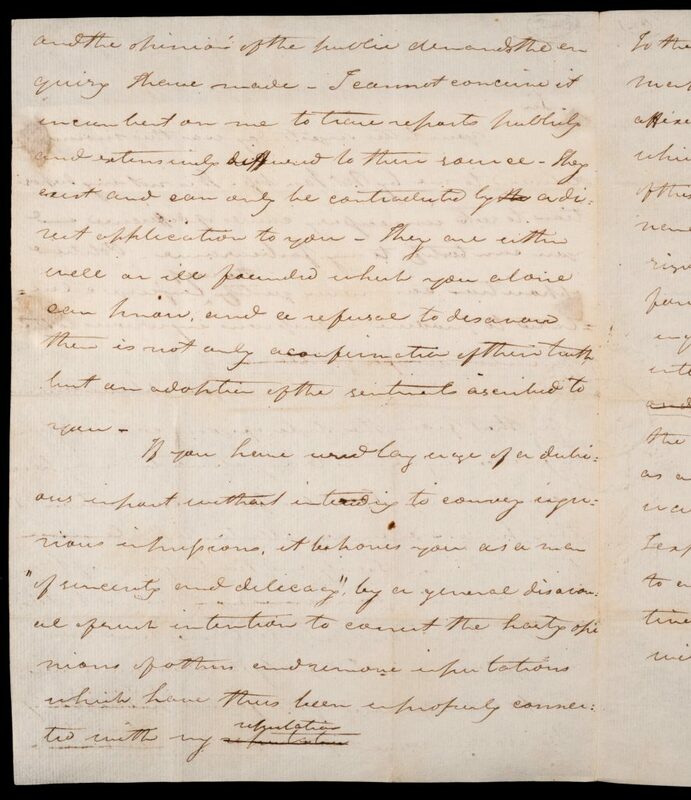 Permit me therefore to solicit again your attention to the inquiry which I deemed before sufficiently intelligible, whether you have indulged in the use of language derogatory to my honor as a gentleman or which in this sense could warrant the expressions of Dr. Cooper. To this I expect a definite reply, which must lead to an accommodation or to the only alternative which the circumstances of the case will justify. 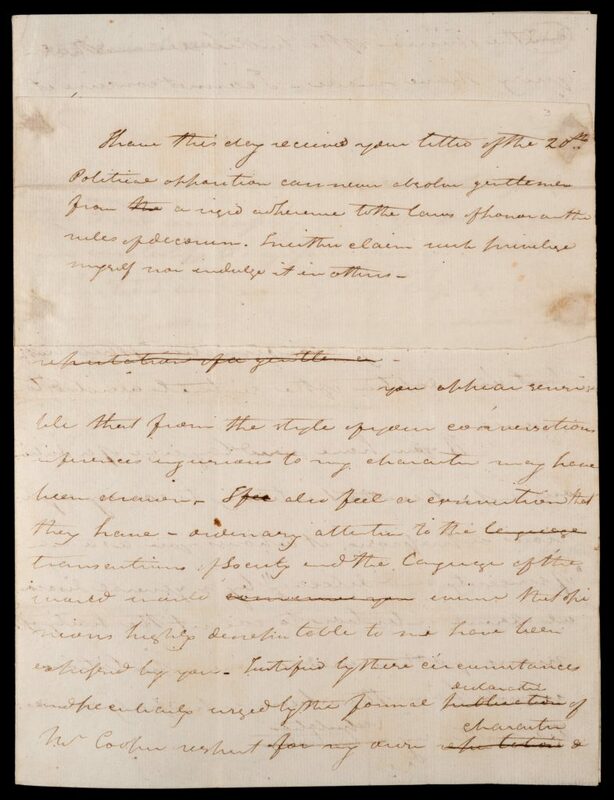 Aaron Burr to Alexander Hamilton, June 21, 1804, Fenimore Art Museum Library, Cooperstown, New York, Gift of Stephen C. Clark, Collection No. 123.